During my first five years of grade school in the 1950s, even out west, construction of the Saint Lawrence Seaway seemed to dominate each issue of the Weekly Reader with news about how it would enable huge cargo ships to transit to and from the Atlantic Ocean as far as 2,500 miles inland via the Great Lakes during nine months of the year. During my recent visit along the eastern shoreline of 7,300-square-mile Lake Ontario and up through the 1000 Island Region where the Saint Lawrence River spills out of that lake as it straddles the US border with Canada, I spent plenty of time on the water with friends but we were still an hour or so below the six huge locks on the up-river end of the Seaway. Unlike today, Republicans during the 1950s seemed to be inspired by President Eisenhower to make huge infrastructure projects such as the Seaway and the Interstate Highway System, bi-partisan in nature. Actually there are actually nearly 1900 islands in the lake-like-archipelago that dots the fifty mile stretch as the Saint Lawrence River emerges from Lake Ontario, under the Great Depression-era-150’-high bridge from the US to Canada and heads northeast toward the Seaway locks. 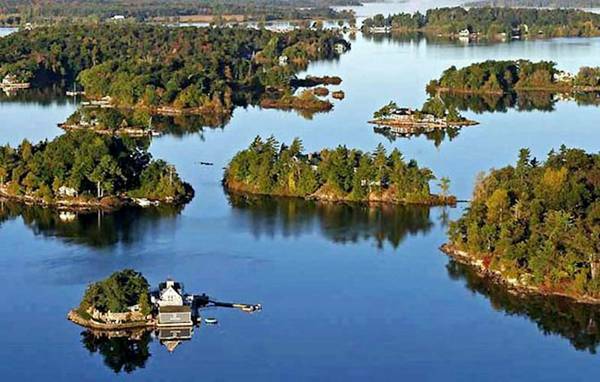 Officially, “the number of islands was determined using the criteria that any island must be above water level all year round, have an area greater than 1 square foot, and support at least one living tree,” and several are populated with late 19th century mansions such as Boldt Castle, operated as public attractions by the bridge authority. On the trip back home, we couldn’t resist cutting east first through the “green” infrastructure of Adirondack State Park, which encompasses nearly 20.2% of the land area of the State of New York, nearly the size of Connecticut and larger than several national parks combined. The purpose of our drive a few days ago was recreation but that is only a by-product of the primary purpose of the park. In fact, the Adirondack was created and then preserved forever by a popular vote of the people of that state as infrastructure to prevent soil erosion, control flooding and preserve watershed and water quality. My great-great grandfathers x 7 understood the importance of this infrastructure when they settled in the early 1600s just 30 to 40 miles downstream from the southern edge of what is today Adirondack Park. Skilled at lowland farming, one family settled an island in the middle of the Hudson that was sensitive to flooding. Shortly after their takeover two decades later, the English began to aggressively deforest the Adirondacks and this accelerated after the American Revolution when New York sold off lands owned by the Crown for pennies an acre to pay off war debt. By 1850, New Yorkers became alarmed at the huge price of deforestation in terms of soil erosion, flooding and water pollution. It took another 35 years for the state to begin protecting the sustainability of what became more than 6 million acres including 57% that are privately owned and 1% owned by towns and hamlets. The Adirondack is truly spectacular, with 3,000 lakes, 30,000 miles of streams and rivers, 2,000 miles of hiking trails and 46 mountain peaks that are more than 4,000 feet above sea level. But parkland infrastructure such as this is ultimately far more crucial to commerce and water quality as well as prevention of soil erosion and flooding. Frankly, it is nearly impossible to imagine elected bodies today being that strategic. Those we elect to safeguard and maintain infrastructure of all types are negligent, if not criminal, when they dismiss infrastructure as mere recreation and then starve it instead of providing much-needed maintenance and upgrades. I hope they just wouldn't make NYC so crowded that what it already is and have a rather sound urban planning. I am thankful that this system doesn't exist anymore. Lucky for us our forefathers found a way not to implement this system. It would only create conflict because there would always be hunger for power. Surely @Samantha, that is something we should be thankful for. The system seems like a big obstruction in sustaining proper development in the area. Also it'll ruin the expense and production of the resources of the area cause, in that kind of scenario there'll be always two forces fighting for authority. Land dispute was an issue back then. I wonder if that would arise again now that the population is increasing rapidly. There must be definite laws that sanction land grabbers to prevent this from happening again.